The acquisition is the latest in a string of purchases by MEDA, many of them under the city’s Small Sites program, which converts small, privately owned apartment buildings into properties owned by nonprofits and preserved as affordable housing. “It’s been over two years since this process started, so it’s a tremendous relief, that’s for sure,” Mackenzie said. Money from the city for Small Sites, however, has run out. 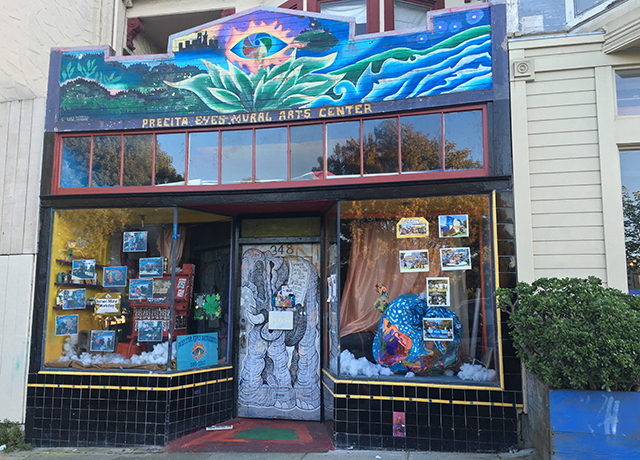 So when the nonprofit approached the owner of 348 Precita Ave. to bid on the building, they needed to work out a fundraising plan. MEDA and Precita Eyes struck a deal with the building owner to raise $28,000 by the end of December 2015, and $200,000 by the end of January 2016. MEDA’s Director of Community Real Estate, Karoleen Feng, explained that the nonprofit met the first deadline with a capital campaign and was then able to extend its next deadline by another month to gather the down payment of some $400,000. Residents, muralists and friends raised $19,500, and MEDA provided the rest via its newly formed Neighbor-to-Neighbor fund, a new approach to financing nonprofit acquisitions that may become a key part of MEDA’s future ability to move quickly in the housing market. The Neighbor to Neighbor fund asks neighbors with available capital or lines of credit to help provide funding for residents who anticipate eviction following the sale of their building. Lenders to the fund will be repaid within a year, with 5 percent interest, once funding from last year’s housing bond becomes available to replenish the Small Sites program. Spike Kahn, founder of the artist space Pacific Felt Factory, originally proposed the fund and was able to raise $200,000 toward it within 24 hours. MEDA also secured a $1 million commercial real estate term loan from Boston Private, a wealth management and private banking services company. The speed with which MEDA could react to a building going on the market with at-risk tenants makes it a viable new alternative for future acquisitions as well. This story has been updated with new information about the involvement of Boston Private. Disclosure: Mission Local rents a commercial office from a MEDA-owned building.